The colors of autumn shine through this glass work and become even more vibrant when viewed in direct sunlight. Formed in the shape a wave, this piece provides a sweeping reminder of fall. In 2014 I began a new journey into the world of glass art at the urging of friends and loved ones. This new interest continues to grow as I transition to retirement and has sparked this new business to create and sell unique work in both stained glass and kiln-formed glass. 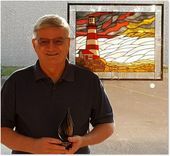 I have been honored to receive 2nd place awards in the annual Glass Gathering Art Show in 2016 and 2017, and a 1st place award in the small panels category of the Annual Art Glass Festival sponsored by Delphi Glass in 2018. Having a vision, refining it into an achievable result, and continuously adapting to accomplish it has driven much of my professional career. As I hone my craft as a glass artist I find that this same pattern very much applies. Working with stained glass draws my focus to the flow of lines and color, to layering glass to achieve depth and shading, and with each new work to reaching for something new. My recent entry into the world of kiln formed glass is pushing constant discovery of how glass reacts to heatwork, opening new possibilities in creating unique work. My goal is to create work that initially grabs the viewer but also allows for the discovery of more and more detail upon continued examination. Throughout this journey, I am learning to appreciate the ever-present touch of serendipity that brings to life the unexpected.